John Gaedeke grew up in a hunting lodge and lives full time on a lake in the Brooks Range guiding tourists. He never thought he was an environmentalist, but now people think he is because he works a second, unpaid job fighting one of Alaska's zombie megaprojects. 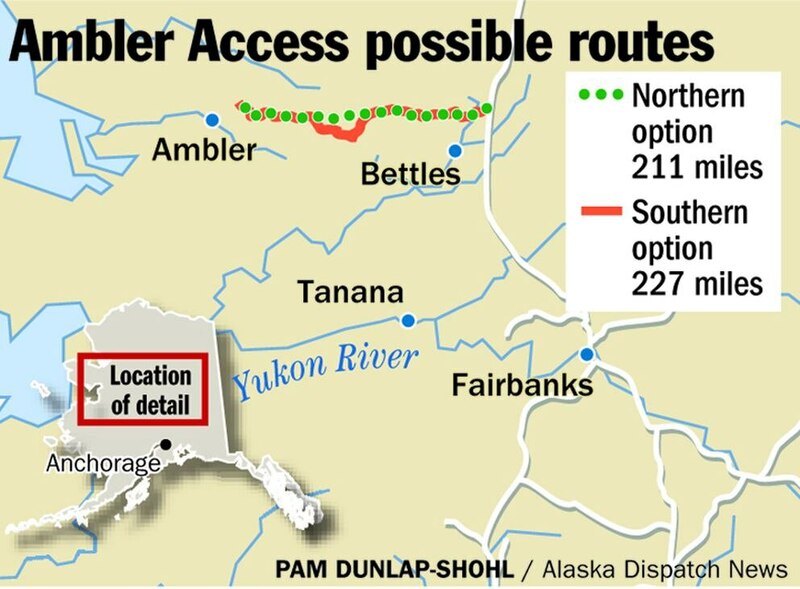 The state is still spending millions of dollars on the proposed 211-mile Ambler Road, a route to a mining prospect in Northwest Alaska expected to cost $450 million. "I am not anti-mine and anti-development but I would like to be pro-thought process," Gaedeke said. "You become an environmentalist if you are against ludicrous development. Which seems like there should be a difference between somebody who is trying to save the whales and somebody who is trying to say this is not financially viable." During Alaska's latest phase of big oil money, dubious capital projects cropped up in our Republican Legislature like mushrooms after a rain. In my last column, I described the $184 million spent on an unfinished rail line on Point MacKenzie. Four other projects have so far consumed another $325 million without producing anything but engineers' salaries and consultant reports. Gov. Bill Walker stopped all four when he came into office but quietly let them start again. All are now consuming state money in the midst of the state's massive budget crisis. Lois Epstein, a professional engineer who works for the Wilderness Society, is the only professional tracking the projects as a group. When I decided to write a column on the subject, I tried to find someone else to interview, because Alaskans don't like to listen to environmentalists (and because Epstein is a good friend). But when I called Gunnar Knapp, the director of the Institute of Social and Economic Research, he said to call "that woman at the Wilderness Society." Epstein's figures, from a report titled "Easy to Start, Impossible to Finish," are footnoted with sources and seem conservative. They show that completing the Ambler Road, Knik Arm Bridge, Juneau Access Road and Susitna-Watana Dam would cost $7.66 billion. Of course, that will never happen. But the projects still have $263 million in cash that the Legislature previously appropriated. Some of that could be taken back and used to help plug the deficit. Some is federal money that can only be used for transportation projects. All of it could be spent better on something that has some chance of actually being built. "The Legislature has such a culture of spending that it doesn't even occur to anyone to look at the books," Gaedeke said. "I kind of feel like we are in the alcoholic stage where we need to hit rock bottom so we will seek treatment." In my next column, I'll offer some solutions, simple good government practices that would keep the state on the wagon. Each megaproject has complex details about how to stop it. A lot of that makes sense only in the weird logic of government, where spending millions in tax money on a study allows you to avoid giving back tax money to another pocket. It's all our money. But it isn't as complex as the bureaucrats are making it. For example, paying back the federal government for transportation money already spent just means spending on other transportation projects in Alaska. I'll focus on the Ambler Road because it is all state money and relatively easy to understand. In October, Walker gave permission to the Alaska Industrial Development and Export Authority to spend another $3.6 million on an Environmental Impact Statement. An AIDEA spokesman told the Fairbanks News-Miner at the time that completing the study would cost millions more than that. I requested comment from AIDEA and Walker's office on Tuesday morning but they were unable to respond by my deadline. I hope to have those interviews for my next column. The state has been studying the Ambler project for seven years at a cost of more than $19 million. But three federal agencies sent letters to AIDEA last month listing basic details that were missing in applications for permits and right of way requests. The financial explanation of the project doesn't make sense, either. AIDEA touts it as similar to the road it built to the Red Dog Mine near Kotzebue in the 1980s and says the road will be paid for by users. AIDEA has a memorandum of understanding with NovaCopper, a company based in Vancouver, which has a mineral prospect in the Ambler District. The MOU says NovaCopper has no commitment even to build a mine, much less pay for the road. In contrast, Red Dog, with the richest zinc deposit in the world, needed a 54-mile road and a port, which AIDEA agreed to build only after the mine owner guaranteed the first five years of operation with a letter of credit, said Bert Wagnon, who was then the agency's executive director. That deal also built in a profit for the state. As Gaedeke learned from NovaCopper and the state's own documents, the money the company could potentially afford to contribute to the road would barely cover maintenance, much less the pay back the massive capital costs. Projects like Red Dog should go forward when the market says they make sense. But Alaska politics is about dividing up free oil money. We leave it to volunteer opponents of each project to dig through thick consultant reports for the absurdities in how the money is being spent. Then the volunteers are branded environmentalists and ignored. Each megaproject has its own cadre of musketeers with a website and a group of citizen experts. The site maintained by the Brooks Range Council that Gaedeke chairs also collects statements of opposition from many groups in the region, including the town of Bettles, Native villages and tribal organizations. They think the project would cost in subsistence and tourism without much economic benefit. The project has another cost too. With the other megaprojects, it has already cost the state the trust it needs before it can impose taxes or reduce Permanent Fund dividends. We need accountability for our money. "We hear helicopters that go over us, and those helicopters are spreading dollars that are not accounted for, and they're definitely not laying it on us," Gaedeke said.